“Over 1.5 million law-abiding Americans who make up Gun Owners of America commend the House Judiciary Committee for reporting H.R. 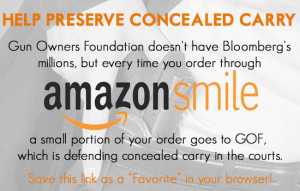 38, the concealed carry reciprocity bill. “GOA applauds the committee passage of H.R. 38 and encourages the House leadership to take up the bill right away. This legislation will allow decent Americans to carry in any state in the country with confidence that they would not become entrapped by the fascist gun laws of anti-gun states. “GOA also sends special kudos to Republicans on the Judiciary Committee who shot down an attempt by Democrats to delete the Constitutional Carry protections in the bill. Gun Owners of America opposed the amendment that sought to only limit concealed carry reciprocity to permit holders and was happy to see that provision go down to an inglorious defeat. Erich Pratt, or another GOA spokesmen, is available for interviews. Gun Owners of America is a nonprofit lobbying organization dedicated to protecting the right to keep and bear arms without compromise. GOA represents over 1.5 million members and activists. For more information, visit GOA’s Newsroom. The Kardashians Talk Gun Control. Again.